How To Repair A Mechanical Heart was such a heart-warming and hilarious look into fandom life. I consider myself a fangirl as well. I dabble in multiple fandoms. I get obsessed with stories and characters I love. I squeel. I use excessive CAPSLOCK. I’m a major shipper. I’ve read so many fanfic and I browse Pinterest for fanart on a regular basis. And this book is like an ode to the wonder that is fandom in all its’ aspects. So can I just quote the fangirls in this book to express my love? I think I couldn’t express it any better! Yep. Also, I kind of wish Castaway Planet was real because I so want to join the fandom! The romance aspect was also pretty perfect. I loved that even though it’s a light and fluffy book, it also tackles some heavier issues and the characters are not without their flaws, which of course impacts the romance. Brandon is dealing with a ton of Catholic guilt. He grew up in a tight and loving Catholic community and is now trying to figure out how to be both Catholic and gay. Abel is out and proud but has his own traumas with dating Catholic boys. So obviously they have quite some issues to overcome but it’s all handled so perfectly. No fingerpointing, no villains, just two boys coming to terms with their feelings and overcoming their issues. While the fandom world is watching. Needless to say, I loved this book. It’s funny, it’s quirky, it’s unapologetically fangirly. It has so much heart. And it’s basically one big roadtrip. What’s not to love? “And when you’re a weird and awkward and paranoid person at all times, CastieCon is the happiest place on the planet. 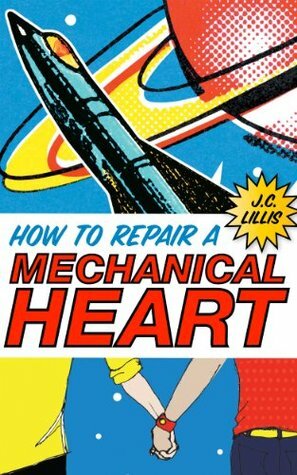 Have you read How To Repair A Mechanical Heart? What did you think about it? YA totally agree! I am myself a part of so many fandoms, and I have read so many fanfics I CANNOT EVEN COUNT. (I have even written 2-3. Hehe) Also, have you read Gena/Finn? It is about two women who spark a friendship over a fandom BUT THAT ENDING MADE ME LIKE IT A LOT LESS THAN I EXPECTED. Anyways, my LIFE IS SPENT on Pinterest. God, I am addicted. OMG YEEEES. I really, really, REALLY loved this book, and I think it’s a damn shame it’s so underrated – the fandom voice was spot on and I love how the characters developed. The exploration of Catholic guilt was pretty interesting, too – I wish we have more of those. I know, I loved this so much and was surprised this wasn’t hugely popular! It definitely deserves more love! The characters were amazing and I love how the Catholic guilt aspect was handled.